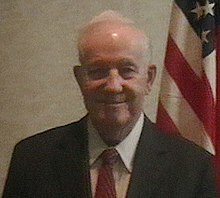 Lowell Jackson "Jack" Fellure (born October 3, 1931) is an American perennial political candidate and retired engineer. He was the presidential nominee of the Prohibition Party for the 2012 presidential election. He also tried to run for president in 2016 as a Repubican. ↑ "Jack Fellure 2012 - The Sword of 1611". Sword of 1611. Archived from the original on October 28, 2012. Retrieved 24 June 2011. ↑ "Jack Fellure 2016 FEC Statement of Candidacy" (PDF). Federal Election Commission. November 7, 2012. Retrieved December 28, 2013.